Also see Advanced Study Institute. Courses may be taken for academic credit or for professional interest. Workshops and the Advanced Study Institute may only be taken for professional interest. Application for the Summer School is now ONLINE. You will be asked to select the courses/workshops and submit your CV. You will be contacted when your application has been processed. If you have specific questions not answered on the website, you can contact the Division Summer Program Coordinator, Ms. Consuelo Errazuriz at tc.psych [at] mcgill.ca. Enrolment for courses and workshops is limited and early application is strongly advised. Please note the application deadlines in order to submit your application. Canadian and International students and professionals applying to the Summer School for professional interest can do so through the Division of Social & Transcultural Psychiatry by following the instructions above in Registration Information. On successful completion of the course or workshop, a certificate of attendance will be provided by the Division. This does not confer formal academic credit, for which a separate application is required (see below). Registration for professional interest is accepted as long as room is available in the course or workshop. 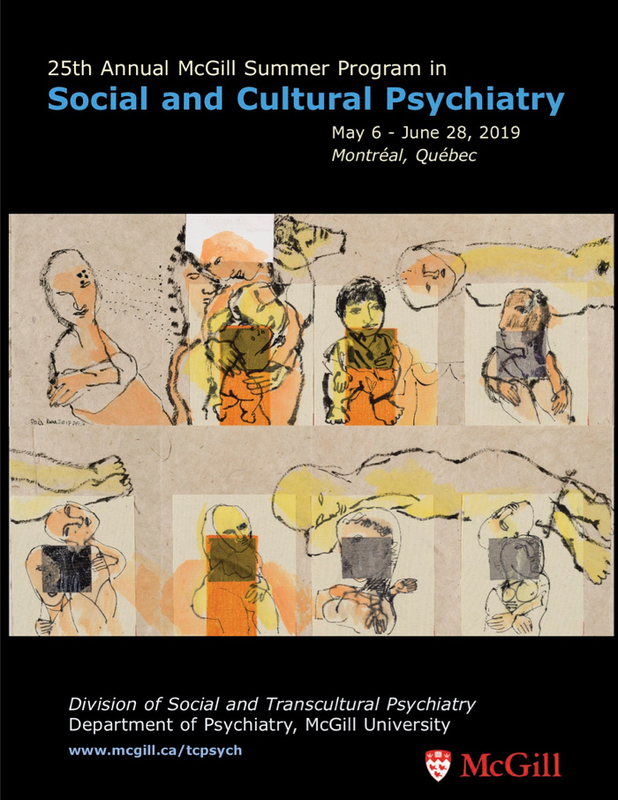 The following courses may be taken for academic credit by students enrolled in a graduate program at McGill or another university: Cultural Psychiatry (PSYT711); Psychiatric Epidemiology (PSYT713); and Research Methods in Social and Cultural Psychiatry (PSYT633). All applicants for academic credit must submit their CV and Registration online as indicated above to obtain permission to attend the course(s). You will receive confirmation that you have been authorized to take the course and all further correspondence regarding the application process for academic credit will be with the Department of Psychiatry, Graduate Program Coordinator. To contact the Graduate Program Coordinator: graduate.psychiatry [at] mcgill.ca, Tel: 514-398-4176. Please apply online as indicated above. After receiving permission to attend the course(s), McGill students should register on Minerva once the summer registration period for graduate students begins. Detailed registration information for students enrolled in a McGill graduate program will be available mid-March 2019 at www.mcgill.ca/gps/students/registration/dates. Students are billed by McGill Student Accounts. Please apply online as indicated above. After receiving permission to attend the course(s), double program students may go to the following link to register https://mcgill.ca/students/records/cc. After receiving permission from the coordinator of the Division of Social and Transcultural Psychiatry to attend the course(s), Psychiatry Residents who want to take the courses for credit must obtain permission from the Graduate Program Director and from the Faculty of Medicine. McGill double program students and McGill psychiatry residents are billed by McGill Student Accounts. If you applied for professional interest, you will receive an e-mail confirming your application. Please apply online as indicated above. After receiving permission to attend the courses, please visit the McGill Graduate Studies website to verify what category of student applies to you. Please observe the application deadline: January 15 for international students; February 15, 2019 for Canadian students. Official notification of acceptance is issued by the Faculty of Graduate Studies. Please apply online as indicated above. After receiving permission to attend the course(s) from your home University and from the Division of Social and Transcultural Psychiatry, you must initiate an online application to request the required authorizations at www.mcgill.ca/students/iut and you must complete a CREPUQ form. Refer to your home university website for regulations on the number of credits allowed, as well as policies for transferring credits. Note: Once the Québec Inter-University Transfer (IUT) application is approved by both the home and host universities, you remain responsible for registering in the course that was approved. At McGill, you must register on Minerva. Please apply online as indicated above. After receiving permission to attend the course(s) from your home university and from the Division of Social and Transcultural Psychiatry, students must submit a Graduate Exchange Agreement form (available from your home institution website) to your home university and to the graduate program coordinator at McGill: graduate.psychiatry [at] mcgill.ca. Please apply online as indicated above. After receiving permission to attend the course(s) from your home University and from the Division of Social and Transcultural Psychiatry, please verify the registration procedure that you should follow: Visiting, Exchange or Special Student by visiting the following link: https://mcgill.ca/gradapplicants/apply/prepare/visiting#visiting. The application fee cannot be applied towards course/workshop fees. Official notification of acceptance as a “Visiting Student” or a “Special Student” is issued by the Faculty of Graduate Studies. Students obtain a McGill student identity number when applying and use this to register for the course(s) on Minerva. Transfer of academic credits should be arranged with the applicant’s own university. Please apply online as indicated above. If you are applying for academic credit, after receiving permission to attend the course(s) by the Division of Social & Transcultural Psychiatry and your own university, you must apply for formal "Exchange Student" status at McGill by January 15, 2019: https://mcgill.ca/gradapplicants/apply/prepare/visiting. Official notification of acceptance as a Special Student is issued by the Faculty of Graduate Studies. Students obtain a McGill student identity number when applying and use this to register for the course(s) on Minerva. Transfer of academic credits should be arranged with the applicant’s own university. September 15 for entry in January for all applicants. January 15 for entry in May for international applicants (and part-time International applicants seeking credit for summer courses). February 15 for entry in May for Canadian applicants and for part-time applicants in the Transcultural courses. March 15 for entry in September for all applicants. Click here for a list of Required and Recommended readings for these courses. This course surveys recent theory and research on the interaction of culture and psychiatric disorders. Topics to be covered include: history of cultural psychiatry; cross-national epidemiological and ethnographic research on major and minor psychiatric disorders; culture-bound syndromes and idioms of distress; culture, emotion and social interaction; somatization and dissociation; psychosis; ritual and symbolic healing and psychotherapy; mental health of indigenous peoples; mental health of immigrants and refugees; psychiatric theory and practice as cultural constructions; methods of cross-cultural research; models of mental health care for multicultural societies; globalization and the future of cultural psychiatry. Prerequisites: Courses in abnormal psychology, psychiatry or medical anthropology, and permission of the instructor. Text: Course readings will be available in paper form and online at the McGill Bookstore. This course offers an overview of the application of epidemiology in the field of psychiatry. Topics include: history of psychiatric epidemiology; epidemiologic research methods in psychiatry (in addition to basic methods, specific lectures will cover meta-analysis, family studies, assessment of needs for care, prevention) ; study of treatment-seeking, pathways to care, and use of services; epidemiology of specific diagnoses (e.g., post-traumatic stress disorder, somatization); research on risk factors (e.g., developmental impact of stress in pregnant women, childhood adversity and mood disorders, cannabis and psychosis); interaction between mental and physical disorders (e.g., depression and diabetes) ; introduction to evaluation of mental health services and programs (e.g., supported employment for people with severe mental illness). Prerequisites: Introductory courses in epidemiology and biostatistics, and permission of the instructor. Text: Course readings will be available in paper form and online at the McGill Bookstore; presentations will be available online. This workshop will introduce participants to research methods in cultural and social psychiatry in a stepwise manner. The course consists of three modules: (1) introduction to qualitative research; (2) introduction to quantitative research; and (3) introduction to mixed-methods studies. Modules 1 and 2 will focus on methodologies, study design, execution, analysis and dissemination. In Module 3, students will learn how and when to integrate qualitative and quantitative approaches in a mixed-method study. Ample time will be given for questions and discussion of participants’ projects. This workshop for mental health practitioners provides an overview of clinical models and methods in cultural psychiatry. Topics include: working with translators and culture brokers; attending to culture, ethnicity, racism and power in individual and family interventions with migrants and ethnocultural minorities; how cultural work transforms the therapist; ethical issues in intercultural work; strategies for working in different settings including schools, community organizations and refugee immigration boards. Invited lecturers will frame the basic issues of clinical intervention through the paradigms of cultural voices and languages of symptoms, art, and play. The clinical intersection of healer, culture, diagnosis, and therapy will be approached by a review of developmental theories, identity, and life-cycle variations in migrant or minority experience. Text: Course readings will be available online. This workshop will provide an introduction to the McGill Illness Narrative Interview (MINI), a semi-structured protocol for eliciting information about illness experience that has been widely used in psychiatry, medicine and global health research. This workshop will present the theoretical basis of the MINI as a tool for qualitative health research. We will also cover the potential links with the concepts and values of Person-Centered Medicine. The workshop will discuss ways to adapt the MINI to study issues involving health behavior, bodily practices, illness, diseases, somatic and emotional symptoms. Participants will practice the MINI in one-on-one interviews and learn ways to code and analyze qualitative data produced with the MINI. This workshop provides an introduction to key issues in global mental health (GMH) research with special reference to low and middle-income countries (LMICs). We will explore the tensions between a vertical public health approach, grounded in a biomedical frame and current evidence-based practices, and a horizontal community-based approach, that emphasizes local taxonomies and priorities, empowerment of local resources and endogenous solutions. This seminar will build a cultural critique of GMH and raise basic issues for discussion: (a) current priorities in GMH research have been largely framed by mental health professionals and their institutional partners based in Northern countries, reflecting the dominant interests of psychiatry and paying insufficient attention to Southern partners and local priorities; (b) the assumption in GMH that major psychiatric disorders are biologically determined and therefore universal; (c) the focus on existing evidence-based treatments, and the assumption that Western standard treatments can be readily applied across cultures with minimal adaptation; and (d) the emphasis on GMH interventions that may marginalize indigenous forms of healing and coping which may contribute to positive outcomes and recovery. The workshop aims to provide a balanced critical perspective on GMH as a new field of enquiry and practice that acknowledges the importance of the social determinants of mental health and the interplay between the social and the cultural with the biological dimensions of mental health. The format includes lectures, panel presentations, case studies and plenary discussions of readings by faculty and students, supplemented by video documentaries and films. Sponsored by the McGill Global Mental Health Program. Text: Readings will be available online. Trauma is highly prevalent, especially in marginalized communities that have faced intergenerational oppression. In this workshop, a group of trauma therapists from the Jewish General Hospital at McGill University and Women’s College Hospital in Toronto will explore the complexities of providing culturally sensitive trauma therapy to individuals from diverse backgrounds. We will outline trauma dynamics and interventions. Using clinical examples, we will then unpack how Western trauma therapy models may not apply to all clients, and examine potential adaptations. We will also discuss strategies to build cohesiveness in group therapy settings through dialogue, while honoring differences. We will present a self-reflexive model that we developed in our program to highlight the interface between trauma and intersectionalities in the group setting. This day-long workshop will combine didactics, clinical vignettes, interactive activities and group discussion. This workshop provides an overview of current controversies surrounding cognitive neuroscience and the implications of recent advances in research for psychiatry, education, bioethics, and health policy. It will present the interdisciplinary project of critical neuroscience as a framework and set of tools with which to critically analyze interpretations of neuroscience data in the academic literature, their representation in popular domains and more broadly, the growth of neurocultures since the Decade of the Brain. This course will problematize and consider alternatives to neurobiological reductionism in psychiatry, neuroethics, cultural neuroscience and neuropolicy, attending to the models, metaphors and political contexts of mainstream brain research. It will also explore various avenues for engagement between neuroscience, social science and humanities. Sessions will be devoted to: critical methods; methodological problems in neuroscience; cultural neuroscience, social determinants of health; psychiatry, neuroeducation; mindfulness; and neuroethics. Text: Choudhury, S. & Slaby, J. (Eds). (2012). Critical Neuroscience: A Handbook of the Social and Cultural Contexts of Neuroscience, New York: Wiley. Co-sponsored by the Foundation for Psychocultural Research (www.thefpr.org) and the McGill Healthy Brains for Healthy Lives Program (www.mcgill.ca/hbhl). This workshop will provide an overview of core topics and recent developments in social, and cultural neuroscience research in order to promote cross-disciplinary collaboration in global mental health. After an introduction to cognitive, social, and cultural neuroscience, the workshop will focus on the potential and limits of methods that can be used to measure epigenetic, neuroendocrine, and neurocognitive processes in laboratory and field settings. We will discuss the inter-relationships of these processes and how to map them onto phenomenological, ethnographic, and ecological variables through technologies including remote sensing techniques that capture health-relevant aspects of sociocultural contexts in situ. Participants will also have the opportunity to present their own research projects for discussion with faculty. This workshop will focus on clinical, theoretical, research, and community engagement issues on the use of art in transcultural psychiatry. Invited faculty will elaborate on clinically relevant theory, practice and experiential learning. Presentations will promote reflection on arts—including theatre, visual arts, music, and dance—as an applied and emerging aspect of healing both historically and in contemporary contexts relevant to clinical practice, global mental health, and research in social and cultural psychiatry. Faculty include an international roster of clinicians working with the arts with people with severe mental illness, youth at risk, as well as indigenous and migrant groups. This workshop will survey recent work on the social determinants of mental health and discuss issues in the design and implementation of culturally appropriate mixed-methods research with Indigenous communities and populations. The emphasis will be on conceptual issues and the development of research methodology to address both common and severe mental health problems and interventions. Specific topics will include: ethical issues in Indigenous health research; social, historical and transgenerational determinants of mental health; the role of indigenous identity in mental health, resilience and well-being; suicide prevention and mental health promotion; participatory research methods; evaluation of community-based mental health services; culturally-adapted interventions; and indigenous approaches to healing. Text: Kirmayer, L. J., & Valaskakis, G. G. (2009). Healing traditions: The mental health of Aboriginal peoples in Canada. Vancouver: UBC Press. August 16, 2019 will be the annual meeting of the Network for Aboriginal Mental Health Research. Registration information will be posted at: www.namhr.ca. Please see our Faculty web page for more information. Note that the ASI conference (June 20-21) will take place at McGill’s New Residence Hall. We encourage you to make your inquiries as soon as possible. Please note that the deadline for the Summer School Program does not apply to the Advanced Study Institute.